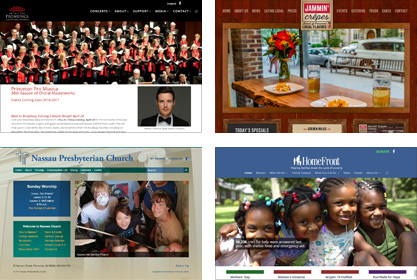 With over 20 years of experience designing outstanding Websites, Princeton Online is an excellent choice for your design and development needs in Central New Jersey and Bucks County, PA.
We create effective, visually appealing, search engine optimized, and fully responsive websites with quick turnaround and customer service that high-end agencies can’t match. Our sites are user friendly regardless of whether viewed on a computer, tablet, or mobile device. We build our websites using WordPress, a powerful content management system that’s easy to use. WordPress websites are easy to customize and maintain without sacrificing quality.